Papa John’s is the official pizza of the NFL. 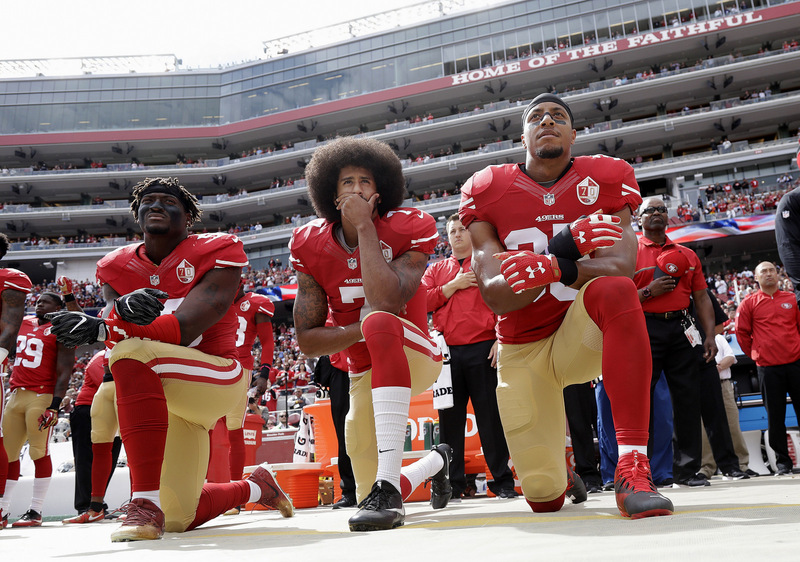 But it seems that some NFL players, in kneeling to protest law enforcement’s racially targeted brutality, were not doing their part to boost pizza sales for the company. Such was the position taken by Papa John’s founder and soon-to-be-former CEO. JEFFERSONTOWN, KENTUCKY -- John Schnatter, founder and CEO of Papa John’s Pizza, will be stepping down from that position once the New Year arrives. It would seem that a place like Rikers Island could use its famous visitor’s message of hope. But Colin Kaepernick’s recent visit didn’t sit well with Rikers correctional officers. They complained that someone of Kaepernick’s “ilk” sends the wrong message to the jail’s 11,000 inmates. Thanks to his “base’s” reflexive flag worship, Donald Trump was able to inflame an already fraught situation — bringing, as is his want, angry division and chaos in his wake, a chaos he apparently needs to thrive both personally and politically. The statements of an aging symbol of White America in its heyday exemplify American blindness to white privilege.